Let me guess. You are a health coach and would loooove to create consistent (and beautiful, specially beautiful) quote graphics for your Instagram feed. Or, wait, you’re a social media expert, and your blog pins don’t stand out amongst the vast ocean of Pinterest. Or, third guess, you’re running your side hustle alongside your 9 to 5 job and don’t have neither the time to create One.Freaking.More graphic, nor the money to hire a graphic designer. No matter where you’re at, but specially if you’re just starting out and you have a tight budget, I’m telling you that you have all it takes to create stunning and attractive graphics that will help you stand out and highlight your brand uniqueness. Your brand will be more easily identified through your graphics, which will be your visual voice, and therefore you won’t need to explain who you are in every touchpoint. Your followers will easily identify you when your graphics sit among a dozen others and will know where they have to click (coming straight to you, baby!). It will inform that your business doesn’t suffer from esquizofrenia and you’ve got your s*** together (even when we all know it’s not always the case). When there’s visual consistency, you look more professional and, trust me, nobody will even know it’s a one-woman show (not that you have to lie, but you get what I mean). Having consistently strong visuals will give the impression that you have a team behind you (or that you’re a superwoman) and rocket your brand to another level. You and I, we’re very lucky. Oh yes. Wanna know why? Because the tools we have to create beautiful graphics in a matter of minutes (I’m looking at you, Canva) is amazing. But these tools are useless (yes, USELESS) if you don’t have a wider scope of what it takes to wear the graphic designer hat for your business. You can go and create as many Canva graphics as you want, which will take you very little amount of time, and they will look beautiful individually, but they won’t represent the ‘graphic designer’ that your awesome business needs. You need more. Your business deserves more. I’m going to help you decide HOW you’re going to use these free tools FOR your business, and give you tips and tricks to use them effectively. I’ll also give you PRODUCTIVITY suggestions to organise your business’ design set-up so you’re able to cruise every time you need to create One.Freaking.More graphic for your business [scroll down to the bottom of the article for the productivity plan]. Your time is gold, and you want to invest it in doing what you love and growing your business. Let’s do it in a way that your graphics don’t suffer. Deal? Wait. You know what I’m talking about, right? If you don’t, no worries, I got your back. Go and get your b**** (branding) together. 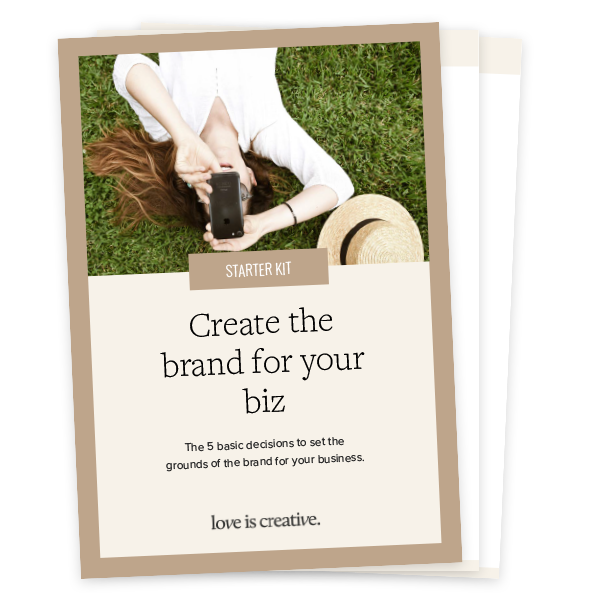 The first thing you have to do is creating the style guide for your brand/business. This is essential to create consistent graphics that speak your brand, so you don’t waste extra time creating a new look for every new graphic, and get a smooth and professional look. How does it look like? A Style Guide is a summary of the visuals of your business, including the colour palette, the fonts, type of photography and all variations of your logo. Ideally, you will have them all in a document that you keep in an easy-to-access folder in your laptop or Google Drive. If you use Canva for Work, you can also upload your brand elements there, so you have easy access if you’ve decided to use Canva to create your graphics. Pinterest is amazing, blah, blah, blah. We all agree on that. But it also happens to be a time sucker and an ally of procrastination. However, it’s going to be really handy here, helping us put together graphic design inspiration that will help you to not waste more precious time every time you create a new graphic. I’ll tell you what you’re going to do. You’ll create a new Pinterest Board called ‘Graphic Design Inspo’ (or similar) and pin graphics that you would totally see for your business. Make sure they all have a similar look, if you want to make things easy for you. Try to have a variety of alternatives for the type of graphics that you use more often in your business (for example, quotes or infographics). Done? Now, every time you struggle creatively to create yet another new graphic, jump on your Pinterest board to get quickly inspired. You may feel tempted to skip this step, or you can’t see how it can actually help you design your graphics. Trust me. If you do it, you’ll end up spending less time struggling to come up with a new design. Designers gravitate between Adobe Illustrator, InDesign, Photoshop, and the new kid in the block Canva. If you’re already familiarised with Adobe, good on you. However, if tech software is not cup of tea, I would recommend you use Canva (and stop working with Paint if you’re still doing so!). Get on Canva, create your profile and play around to get to know all its features: templates, custom dimensions and have a look at their graphic design tutorials like this one on Consistent Branding. Really consider upgrading to Canva for Work (from US$9.95), which will allow you to save your own templates, create folders or upload your brand elements (remember: colours, fonts, photos, etc), helping you be more organised and efficient. Let’s jump in and create the graphics that you need for your biz. Depending on the type of business you’re running, you may need graphics for Instagram (such as quotes or Insta stories featured images), for your Blog (which you will then pin on Pinterest to get some traffic) or for client proposals. Have a think and locate the ones you’ve been designing so far. Don’t go straight to Canva (or any Adobe app) before having a clear idea of what you’re there to do. Grap pencil and paper and map out the information structure that your graphic will feature. Does it need a big title? A short line of text? Where will your logo be placed? Are you including a photo? If so, where is it placed? Once you’ve mapped out the composition of your graphic, fill in the blanks and write the text that it will include. Make sure it’s not too long, it’s catchy and brings out the voice essence of your business. I know, it’s easier said than done, but tweak it until you get what you want. Where will you place each word or sentence? What’s will the size or style (italics, underline, bold) be? Answering these questions will help you create hierarchy to your information. Remember you still haven’t jumped onto your design software. Sometimes you’ll need to use photos for your graphics. Sometimes getting amazing, non-blurred photos doesn’t happen. And let me tell you one thing: It. Does. Not. Look. Good. One of the most important, and easiest things to fix, is getting images that don’t appear blurred. If you take the photos, check them on your laptop before you wrap up the photoshoot. The same if you get a photographer. If you download or buy a photo on a free stock library, make sure you’re not making it look blurry when you reduce the file size. A quick tip? Always reduce the size of the image (pixels), instead of decreasing the quality straight away. Have I already mentioned Unsplash as my favourite free stock library? The style of their images is super trendy and you will easily find something that will suit your modern business. My efficiency tip? Sign up and create a profile on Unsplash and create a collection (or as many as you want). Then, as you go along scrolling down the feed, save the images that you like for your business. Then, when you need a photo, jump straight to your collections folder. Again, efficiency at its best! Leave more blank space (same with websites): some of the biggest no-no’s that I see with graphics is having texts too close to the edges. It looks very amateur. Leave space for texts to breathe and consider shortening the words if needed to. Canva created a challenge to let you experiment with blank space. Take one element out. Is the graphic too crowded? Take something out. It can be an image, some text or an icon. You choose. Use only 2 or 3 accent colours. You might be using way too many. Even if your life emblem is the rainbow, stick to 2 or 3 colours that represent your business and use them throughout your graphics. You don’t need to always apply all of them in one single graphic, but use them across all your creations. Some graphics can highlight one colour, other ones will feature another. Remember, grab your style guide and follow through. Use maximum 2 fonts. Same with colours, stick to your brand typefaces and use them consistently. Ensure text is legible. If it isn’t, ask yourself: is the font size too small? Is there too much text? Is the line-height (that is, the space between lines of text) too narrow? Is the text not standing out from the background? Make sure it doesn’t look blurred. Save your graphic and then open it. Does it look blurred? Check that you created it in the right size and format for its purpose (Canva templates have the right measurements for each graphic), and make sure you saved it to high quality. Blurred graphics? They have no place in your biz. STEP 2. Sit down and make a list of the most common graphics that you use (for example, instagram graphics, shareables for your blog, worksheets, etc. STEP 3. Spend a couple of hours putting together graphic design inspiration on Pinterest and sign up on Unsplash to save your favourite images for your business in your collections. Look further up on the article if you don’t know what I’m talking about. STEP 4. Set aside one day in your schedule to create one or two templates for each of the most common graphics that you’ll need. Remember using pen and paper first, and then digitalising these templates with your chosen software. This is an important step, as it will allow you to reuse designs and not have to start from scratch every time you need a new graphic. If you’ve noticed, all bloggers use the same template over and over again for their graphics. STEP 5. Set another day in your schedule to update or upload all your graphics on your website, blog and/or Pinterest. Your business branding now looks legit and your graphics look awesome - you amazing superwoman! Let me know if you have any doubts about the process, or if I can help you further in the comments below.